One of the primary goals of dentists like Dr. Hisrich is to preserve natural tooth structure as much as possible. We do this by teaming with our patients on prevention. At the same time, we would be doing you and your family a huge disservice if we limited our practice to preventive care, or even to basic restorations. Sometimes, it is necessary to consider how a tooth can be replaced. Historically, this has been done with a dental bridge. Dental bridges come in various forms. 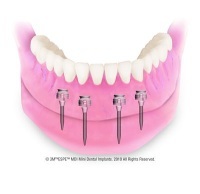 Most often, patients consider the fixed bridge, for very clear reasons. The fixed bridge is stabilized on two healthy teeth, which hold the artificial tooth in place. Once affixed to these anchor teeth, the bridge should function comfortably for years. While this restorative process has served patients' needs for many decades, we now have an alternative that is worth considering: dental implants. Preserve natural teeth. The down side to bridge work is that it is necessary to reduce two otherwise healthy teeth so that they may be fitted with dental crowns. Yes, crowns are "protective" fixtures that are often used to repair damaged teeth; but this does not mean that unnecessary restructuring of natural teeth is ideal. Dental implants are individual posts that sit-in for natural roots that have been lost. To replace a single tooth, one implant will be affixed with a crown, which then requires no further stabilization from adjacent teeth. Preserve bone. Natural anatomic structure has teeth tethered to the jawbone by roots. More than a stabilizing trunk, teeth roots are necessary for the delivery of nutrients to the teeth, and the delivery of stimulation into the jawbone when chewing occurs. Over the course of history, we have discovered just how important this is to facial structure. When the face is observed, one of the characteristics that is indicative of youth (or age) is the distance between the chin and the tip of the nose. What creates this space is teeth and the jawbone. When bone degrades, this space decreases; and the closer the chin gets to the nose, the older a person appears. Because dental implants take the place of roots, and continue to transfer stimulation into the jaw bone, these structures are beneficial to long-term facial contouring. We can help you find your best solution to missing teeth. Call (330) 493-8400.